Cheryl comes to SDV following a stellar law school career, having graduated 5th in her class. She was a recipient of the Justice Anthony Kennedy Scholarship as well as numerous academic excellence awards. Cheryl L. Kozdrey comes to SDV following a stellar law school career, having graduated 5th in her class. She was a recipient of the Justice Anthony Kennedy Scholarship as well as numerous academic excellence awards. Cheryl served as the Executive Director of Notes and Comments for both Law Review and the International Law Journal, and was also an academic tutor in Contracts and Legal Writing. Her law school intern/externships included work with the Hon. Gonzalo Curiel of the United States District Court for the Southern District of California as well as with the U.S. Department of Justice and the Civil Division of the U.S. Attorney's Office, both in San Diego. Prior to pursuing her legal career, Cheryl worked in Healthcare Administration. 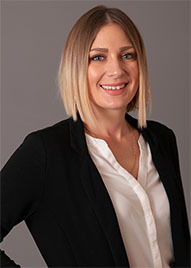 With over ten years of experience in the health care industry, she managed all aspects of ophthalmic surgical services including Lasik, refractive cataract surgery, and oculoplastic procedures. She is a member of the Public Service Honor Society, recognized for her volunteer service with the United States government. Cheryl currently resides in Temecula, California with her husband and two sons.